The largest yellow star ever observed defied even the expectations of the astronomers who discovered it. The hypergiant, HR 5171, has a diameter 1,300 times the sun and is a million times brighter than the star at the center of our solar system. The yellow hypergiant was observed by the European Southern Observatory’s Very Large Telescope (VLT), and the research was led by Olivier Chesneau, from the Observatoire de la Côte d’Azur. HR 5171, also known as V766 Cen, HD 119796 and HIP 67261, is located 12,000 light-years from Earth and can actually be observed with the naked eye. ESO notes it requires a sharp eye, but would-be astronomers can look towards the constellation of Centaurus in the southern hemisphere. Yellow hypergiants are extremely rare stars, with around 21 known examples. HR 5171 has a surface temperature of 5,000 degrees Celsius (9,032 degrees Fahrenheit). 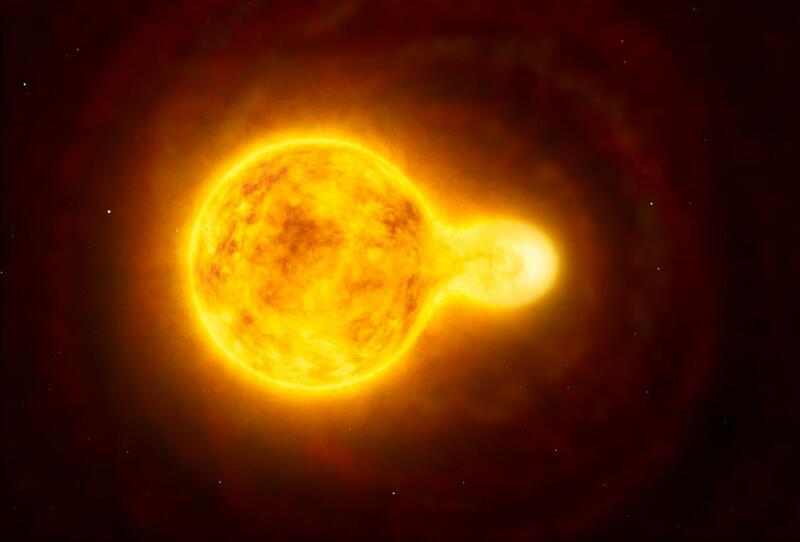 The yellow hypergiant contains a close-orbiting companion, with the two stars actually touching, and Chesneau describes the stellar system as a "gigantic peanut." "The new observations also showed that this star has a very close binary partner, which was a real surprise," he said in a statement. The companion star orbits in front of the yellow star and takes 1,300 days to complete one trip. Despite its small size, the companion star does affect HR 5161, even "stripping off its outer layers" says Chesneau. Chesneau and his team combined observations of the yellow hypergiant to create a 140 meter (459.3 foot) "super" telescope. The researchers used 60 years of data from the VLT as well as the Anglo-Australian Telescope, the South African Astronomical Observatory and the Gemini South telescope to observe the yellow hypergiant. The previous observations and the new VLT observations let researchers gain new insights into past behavior of HR 5171. According to the researchers, the yellow star was even bigger than they expected. They first estimated it to be around 400 to 700 times bigger than the sun but the VLT observations put HR 5171's size at actually 1,300 times larger than the sun. Not only is the yellow star larger than expected, it is has actually grown. ESO says, based on the last 40 years of observation, the yellow hypergiant has expanded as it has cooled. While HR 5171 is huge, it is not the largest star ever discovered. That distinction belongs to UY Scuti, which is 1,708 times the radius of the sun. Based on the observations, the yellow hypergiant is among the eight largest star ever discovered along with PZ Cassiopeiae (1,260 to 1,340 times the radius of the sun) and AH Scorpii (1,287 to 1,535 times the radius of the sun). Chesneau and his team's research was published in the journal Astronomy & Astrophysics. You can view a video of HR 5171's location here.